Are you looking for a guilt-free yet flavor-filled breakfast, snack, or even dessert? The smoothie bowl is the hottest health food trend that is sweeping the nation. Topped with fruits, granola, and spreads, these bowls are not only delicious but make the perfect Instagram post to add to your feed. The best part is that the beautiful bowls are packed to the brim with antioxidants, vitamins, and superfoods. Within the last year, two smoothie bowl shops, Playa Bowls in Doylestown and Frutta Bowls in Quakertown, have opened up in our local area. At Playa Bowls, there are a variety of bowls that are made with different superfood bases. They offer acai, pitaya, coconut, green, chia, and banana bowls all made with high-quality ingredients. 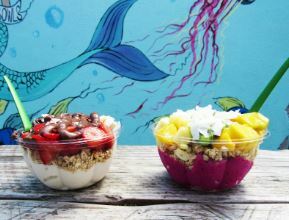 In addition to fresh ingredients, Playa Bowls prides itself in utilizing Ingeo, a plant-based plastic, in order to cut back on pollution and keep beaches clean. That’s another reason to feel guilt-free about shopping at Playa Bowls! The store itself provides a tropical ambiance that they’ve branded as “Pineappleland.” The relaxing atmosphere makes you feel as though it’s a summer day no matter the time of year. What started out as a stand outside of a pizza shop in Belmar, NJ, is now a growing franchise of smoothie bowl shops that are bringing paradise to over 65 communities. We spoke to an employee at Frutta Bowls, Sam Muredda, and said she “love[s] working there because it’s super fun and there are great people.” She thinks smoothie bowls are the latest trend because they are “healthy but you can enjoy yourself.” Another frequent customer of smoothie bowl shops, Tori Fuchs, said, “It’s a nice treat after a workout. I like the Nutella bowl because of the chocolate and fruit together.” So take their word for it, and try out a smoothie bowl the next time you’re looking for happiness and health!